Michael Offutt: How To Train Your Dragon 3: The Hidden World pushes the message that men will always lose their best friends when a woman comes along to marry them. How To Train Your Dragon 3: The Hidden World pushes the message that men will always lose their best friends when a woman comes along to marry them. This weekend I got a somewhat rare early access ticket for one screening of How To Train Your Dragon 3: The Hidden World. I'm going to review it now, and this post may have a few spoilers in the sense that I'm examining it for what it is: the end of a trilogy. In other words I'm asking myself and others who read my blog if this really was a good ending for a trilogy. First off, I want to say that How To Train Your Dragon 3: The Hidden World is a good movie. It has a solid plot arc, it advances the story from the previous installments, and it provides a conclusion that is indisputable in its finality. I mean...there's literally nowhere else for this franchise to go. It's done, nail in coffin, so to speak. My big question about this is why? Maybe Dreamworks was just tired of doing this series, even though it was a money-maker for them? It sure seemed that way in the telling of this particular show. 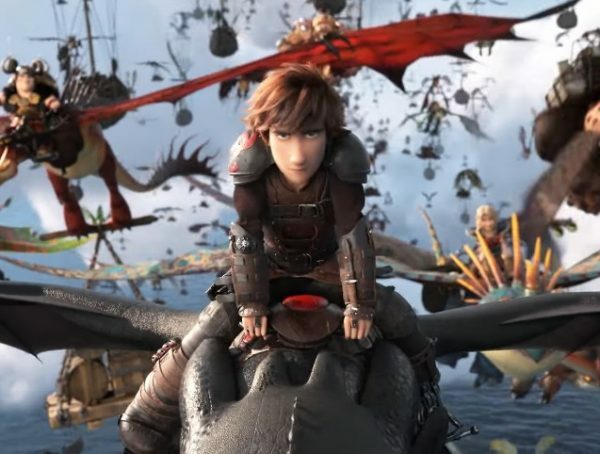 We get two big time jumps in this movie: Hiccup marries Astrid (which you know was going to happen), and you see Hiccup with his kids and Astrid at the end of the movie visiting the dragons that (spoiler warning again) they set free to live in the Hidden World that they found in their youth. All the dragons go away to live in this world, including Toothless and his mate. Poignant maybe? But why? If the point of the show was to be about humans and dragons living together, the ultimate lesson we learned is that humans and dragons were incompatible (in this fictionalized universe) and that ultimately it was the humans that caused this to pass. It's a weird thing to be harping on, and it makes for a kind of strange tone as the movie repeats the same theme that you've seen before: bad human threatens dragons yet again and bad human gets defeated but this time there's a permanent way to give dragons a home so that we can't use this plot again. Additionally, this movie shifts its protagonist from Hiccup (who is front and center in both movies) to him taking a backseat to Toothless courting his mate (the Light Fury you see in the trailer). I'm sure this will be very popular with kids (as it probably should be). But there's probably thirty minutes in this film with no dialogue. It's just Toothless doing cute things with the Light Fury and because we cannot speak dragon, it's like watching cat videos of felines playing with each other with no narration for thirty minutes (there is good music). It's kind of the same thing that 2001: A Space Odyssey did with its enormous expose's of space travel...you got musical overlay because in space, there is no sound. The definition of poignant is a thing that evokes a keen sense of sadness or regret. I felt that in walking out of the theater after having watched this final installment of the HTTYD movie franchise. I felt it mostly because the character of Hiccup was so young when they just decided to time jump, have him marry Astrid, time jump again to middle age with kids that are probably 8 and 10 years old only to see him take a boat to where the Hidden World is located in the hopes of seeing Toothless one last time (which does happen as Toothless is playing with his own litter of kids at this point). And at first, Toothless doesn't even recognize him. 1) Humans don't live well with other intelligent species and probably never will (except for maybe a rarified few). 2) Men will always lose their best friends when a woman comes along to marry them (to the point of not even being able to recognize them as Toothless did at first). 3) A woman is worth the sacrifice that the man makes of his best friends because, hey, you get kids. These are weird messages to be pushing from a series that I very much enjoyed in the first two installments. Additionally, the lack of a fresh story (just more of the same from HTTYD 2) seemed just a bit disappointing. I would still recommend seeing the movie; it is a lot of fun. That's disappointing. I thought the last film was too dark and heavy and sounds like this one didn't get any better. So the only way to coexist with another species is to not coexist? That's a positive message. There's never a nail in the coffin. I mean, there's a new Toy Story movie on the way, and 3 was very final. I thought that these were based on books, and this one is based on the last book in the series. I may be wrong about that. I do hope to see it. Maybe the storytellers are planning a whole different story or series in which humans learn to get along very well with another intelligent species. Of course, this means it would be fiction.